Comic-strip books are often a popular choice by struggling readers, but don’t assume that these texts are always easy to read. Sometimes, the text is written in capital letters and that can present a challenge to the struggling reader. Also, pupils (and adults!) can be uncertain about what to read first – the text above or below the artwork, or what is written in the speech bubbles. Text below picture (also known as a Monologue box): The heroes had to blast the spaceship door. Speech bubble: We must blast the spaceship door. If the comic-strip book tells the story exclusively through speech bubbles, then the layout of the speech bubbles is a clue to the order of reading. The speech bubbles at the top of the page should be read before the speech bubbles further down the page. Text below picture: The heroes blast the spaceship door. Speech bubble 1: Use your laser gun. Speech bubble 2: Take care, the Klingons might be waiting for us on the other side of the door. In these cases, it is not possible to say whether to read the text below the picture first or the speech bubbles first. Decide what kind of text/layout format you are dealing with and, in the prepared reading, give the pupil advice such as, ‘Read the text below the picture first’ or ‘Read the speech bubbles from top to bottom’. As there are so many different layout options, it’s best to decide what to do based on what you see on the page. If a specific reading order is required, i.e. Monologue box first or speech bubble first, then guide the pupil by pointing at the text to be read first and then, when the pupil has read that, point at the next text etc. 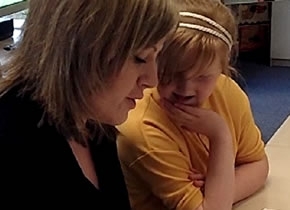 This isn’t ‘over-helping’ the pupil – it is just making the best use of the 6 minutes of the pupil’s reading time.